The Historic New England Collections Care Project involves important upgrades to our collections storage space in Haverhill, Massachusetts. Now in the second phase of the project, our collections specialists spend each day loading carts with objects from the temporary storage area and transporting them to a workspace where each object’s accession record is updated and its photograph taken. Our efforts will enrich public access to the collections via the Collections Access database. We’re pretty excited about that! 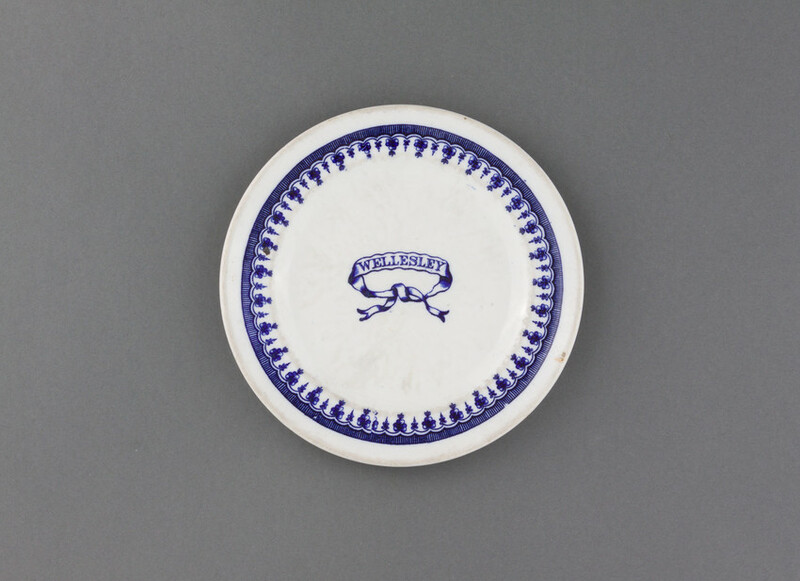 Recently, a short note in the record of an otherwise unassuming plate caught our attention. The note read, “This is one of five plates that survived the Wellesley fire.” Our curiosity was piqued and, after some quick research, we discovered that, nearly 101 years ago this month, Wellesley College burned to the ground. Wellesley opened in 1875 with the entire college–student and staff housing, classrooms, science labs, art studios–in one enormous building, College Hall. In fact, at the time, College Hall was one of the largest buildings in the United States. Situated above Lake Waban and surrounded by 300 acres of estate-like grounds, it was the manifestation of founder Henry Durant’s vision of the College Beautiful. Late in the afternoon of March 17, 1914, the magnificent College Hall, which had taken four years to build, burned to the ground in about four hours. Accounts describe a calm evacuation of the building with no lives lost. It seems the student fire chief at the time had “insisted on unannounced nighttime fire drills in each dorm (against the advice of the College physician)” and the drills paid off (according to “Up in Flames” by Lisa Scanlon Mogolov in a special issue of Wellesley magazine, The Night That Changed Wellesley). The 100th anniversary of the fire was commemorated by the university last year with a gathering in the college’s Houghton Memorial Chapel, the place where students and staff had gathered the morning after the fire. The commemoration included an exhibition of objects saved from the building by students and faculty. The stories a simple object can tell keeps us engaged and excited, cartload after cartload. If you are fascinated by this story and the others that historic objects tell, please consider a donation to the Collections and Conservation Fund.